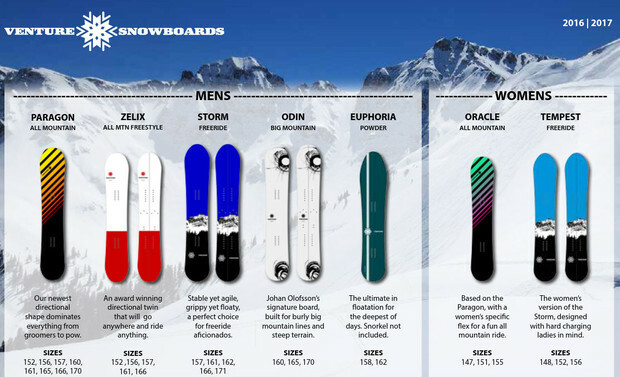 Venture Snowboards' 2016-17 Line-Up. Venture photo. Last season, one of the most beloved board manufacturers in the businesses, Venture Snowboards, unexpectedly shut down production at its Silverton, CO factory. The announcement shocked most of the snowboard industry, including Venture's diehard following of big mountain riders and splitboarders. The press release from co-owner Lisa Branner read, "Venture Snowboards has encountered some challenging terrain in recent months. Circumstances beyond our control have forced us to make a tough decision. We will not be delivering any boards to market for the 2015-16 winter season." Speculation disseminated about production costs and small profit margins after the worst snow year in living memory. However, both Klemens and Lisa Branner, the husband-and-wife team who conceived the idea of a environmentally focused, big mountain snowboard company as powder-chasing students at Colorado State University, made no definitive comments about why Venture ceased production. Nor did they confirm whether or not Venture would return in the future. Now, the Branners and Venture Snowboards have announced that they are planning an official comeback with a new line of big mountain decks and splitboards for 2016-17. For the first time ever, they will be releasing two female-specific boards, the Oracle and the Tempest. They'll also be making a new all-mountain board called the Paragon. Note: If you are headed to SIA, Venture Snowboards will not be exhibiting. However, you can stop by the Spark R&D booth to let them know how happy you are to hear this news. You cannot order their boards just yet, so chill. Here are the amazing article to all web users need to getting more settings windows 10 and access the all way of system update for the batter working online thanks.